3. they think it is expensive. We will do everything possible to minimize stress and make the whole process as enjoyable as possible. It should be fun to turn a keepsake, diploma, or portrait into something beautiful that you can enjoy for years. There are cheaply-made framed items from ‘decorator outlet’ stores which can decorate your walls, or you can have custom framing done at reasonable prices. We buy in large quantities, stock just about everything we sell, and always provide quality craftsmanship. Compare prices – you’ll want to choose ART & FRAMING PLUS where our everyday prices meet or beat the ‘50% off’ prices of our competitors. 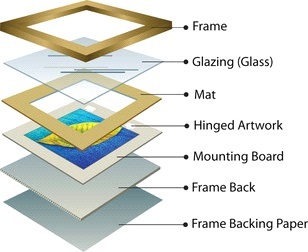 We will explain the framing process and make you comfortable with your framing selection for your treasured item. 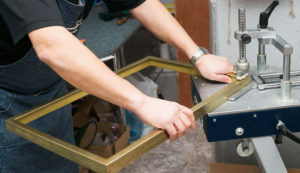 There are several pieces of specialized equipment that custom framers use (double miter saws, underpinners, computerized mat cutters, etc.). Being the size framing operation that we are, we have some equipment that most other frame shops don’t even have. We also perform services for many local frame shops that don’t have large enough equipment to handle the work, or don’t have the expertise for a project. Although we have the capabilities of handling the largest commercial projects, we devote all of our attention and resources to each and every framing job that comes in the door. Simply put, framing is what we do and we pay close attention to every detail. When it comes right down to it, it really doesn’t take all that long to cut a frame, join it, cut the mats, dry mount the poster, cut the glass, fit the poster in the frame, and finish the frame. 1. they don’t do the work on site, and/or 2. they don’t stock the material. We stock over 40,000 thousand feet of over 300 different frame moldings, and over 250 different matboards.. We don’t have to wait until the end of the day to place an order with our local supplier – we are the supplier! Our turnaround times are based on the needs of the customer – we have often completed custom frame projects for procrastinating shoppers on Christmas Eve! We do just about everything that is conceivable for a professional frame shop, plus more, from conservation framing to commercial framing to framing ‘refrigerator art’. We offer varying levels of framing for those who wish to do part of the work themselves – we sell length molding to some, cut and unjoined frames to others, as well as full sheets of matboard. Most of our regular framing services are available in bits and pieces as well, from dry mounting, cutting glass, cutting mat openings, etc. We also sell mirrors. We are prepare ‘signature mats’ for weddings, retirements, and graduations. We frame stained glass windows, jerseys, flags, medals, and awards. We frame guitars, golf balls, and guns. We stretch canvas (paintings, giclees, etc.) for normal framing or ‘gallery wrapped’ for the edges to show. We can also pick up and deliver work. We’ve shipped framed items out of state and recently to a customer over a 1000 miles away! Frame shops often stress how they concentrate on ‘conservation framing’ (or ‘museum framing’ or ‘preservation framing’). We are certainly no exception. Such framing does cost more as different materials and techniques are required. We certainly recommend conservation framing where appropriate, but we believe the decision on whether to spend a bit extra to ‘preserve’ something is your decision. Some items have intrinsic or sentimental value that needs to be preserved; other items may be more decorative or temporary and ‘preservation for the ages’ isn’t important. You may have heard of UV glass. UV-filtering glass is NOT better quality glass – it filters UV rays which can harm artwork exposed to the UV rays for a period of time. But UV glass also costs about twice what regular glass costs. If you are framing some ‘refrigerator art’ or an item that will hang where there will be minimal (if any) exposure to UV rays, shouldn’t it be your choice whether to spend the extra money for UV glass? It is at ART & FRAMING PLUS. We are happy to discuss any aspects of ‘conservation framing’ with you and answer any questions you have. Do you need some framing ideas? Births: You can frame birth announcements, photos, hospital ‘foot prints’, or you can even insert photos behind letter cut-outs of the baby’s name. Birthdays: You can treat someone by framing something that has special meaning to them; something that may just be sitting around or in a box somewhere – a momento from a vacation, items from military service, something they made or painted, or maybe something you made for them. Graduations: Diplomas, announcements, graduation portraits, tassels, and mortar boards are all great things to have framed. Weddings: Certainly wedding portraits and invitations are great framing projects, but most newlywed couples will need framed art and mirrors for their home. ‘Signature mats’ are great idea for weddings as well. Anniversaries: Framing ‘then’ and ‘now’ photos and photos of the years along the way are great ideas. Also, for milestone anniversaries, you can have mementos framed for display. Again, ‘signature mats’ are great for anniversary parties to allow well-wishers to express their thoughts on a permanent display. Vacations: Photos and souvenirs from vacations are great framing ideas. Personal Events: Also, there are events in everyone’s lives that deserve preserving and displaying for future enjoyment: photos of baby’s first steps, baptism photos and gowns, photo and lock of hair from baby’s first haircut, first day of school photo, first report card, special school art projects, school awards, scouting or other accomplishments, sports/music awards, newspaper clippings, business recognition and awards, family mementos that are sitting in a box in a closet, a new portrait after a makeover. Personal Nostalgia: Display and enjoy some of the items that bring back special memories: an album or C.D. of a special song, tickets from a favorite event, a signed cast from a broken arm, an autograph (on a napkin, baseball, guitar, etc. ), eyeglasses, necklace, or pocket watch from a grandparent, a collection of stamps, coins, or arrowheads, a letter received from someone special, a menu from a special restaurant or special meal, an old land grant for family property, or an old family name crest. Sports Memorabilia: Whether it’s a collection of rare baseball cards or an autographed game-worn jersey, there are many fantastic sports items you can get framed. Retirement Gifts: Another popular framed gift is the Retirement Gift. A good framed retirement gift can apply to any field of work – whether it be service to your country or community, a career in education, contracting, corporate or non-profit, and others. We do a lot of custom framed retirement gifts here in the Washington DC, Northern Va area! We serve four-star generals to local electricians. 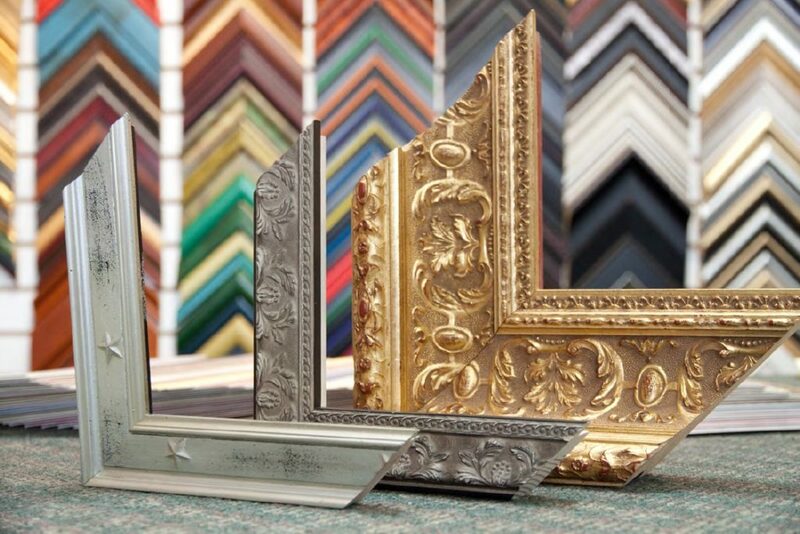 Choose ART & FRAMING PLUS, Springfield’s preferred custom framer.